The development as well as the purchase behavior of a table tennis player commonly take place in 4 steps. Hence, the material used (blades, rubbers, ...) will always be adjusted according to the current, but also steadily increasing, gaming level. The table tennis bat configurator is only necessary in the last, the fourth step. This step corresponds to the stage when a club player is searching for his/her individual, best fitting material. Prior to this, a player usually goes through the following steps in his/her career. Professional Allround Table Tennis Bat: Most suitable to learn and consolidate various techniques. Table Tennis Bat for Kids: Special features: Low weight, and a slightly smaller handle. Perfect for small children´s hands. Donic Defplay Slice 40: A recommendation as a defensive bat from Donic. Donic Appelgren Allplay Quattro: This racket from the house of Donic is suitable for the allround gaming style. Donic Waldner Bluefire Spin: A Donic bat recommended for the spin-oriented offensive. Donic Ovtcharov Bluefire Speed: This bat from Donic is made for the speed-oriented offensive. The suggested products above are suitable for a large number of players, regardless of the league. The recommended products are usually in stock, and are significantly reduced! The reason for this is because we often sale these products. Hence, we can purchase larger quantities at lower prices, and we are happy to be able to transfer this discount toward our customers! Who likes to read shall also get to know ALL TABLE TENNIS RUBBERS and ALL TABLE TENNIS BLADES of the most popular and common brands. Then, you can decide for yourself how your bat will be compiled. This is done using our table tennis bat configurator. In case you think about compiling your individual table tennis racket according to your own strengths, you probably dig through many huge catalogues, or search through the web for hours. The only aim is to find the equipment which fits you most, bringing maximum success. There are more than 50 table tennis brands. Considering that each brand is trying to convince you with 30 to 50 blades and rubbers, you will notice pretty soon that - without any organization or structure - it is extremely hard to find the appropriate material in the jungle of table tennis products. 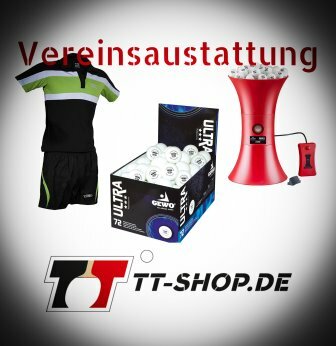 TT-SHOP.COM wants to help you by making your search easier! Table tennis blades: Choose the desired brand, and check out the manufacturer specifications. "Black for forehand, red for backhand"
If nothing is clicked, the blade will be delivered separately, and the rubbers must be mounted by e.g. yourself. Choosing the table tennis rubbers follows the same principle. Table tennis rubbers: Choose the brand, and check out manufacturer specifications. 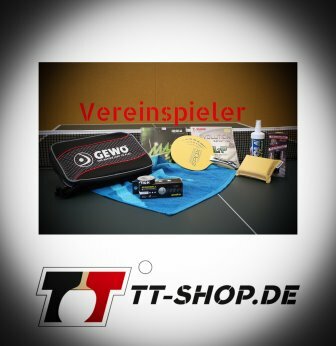 In the description of the category "table tennis rubbers" you can find further links to summary tables containing all table tennis rubbers (sorted by brands). An example: If you choose a table tennis blade plus two table tennis rubbers, and if you then click "mount ordered rubbers", you will be able to individually compile your own racket. The table tennis racket configurator is operated by yourself! Simply add your desired products (including the information whether or not these shall be mounted) to the shopping cart - that´s it! Savings set of 2 rubbers: Get at least 20% off when ordering 2 rubbers from the same product family! 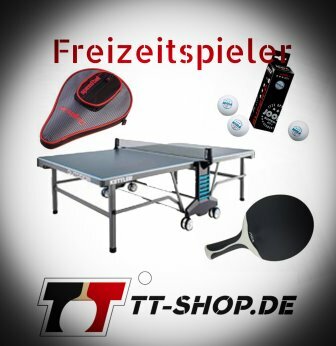 Possibility 1: Buy a new table tennis bat (TT-SHOP.COM assembles and mounts your bat for you, so that you can use it right away!). Please also read the description of our bestseller, the professional table tennis bat, or of our table tennis bat configurator above. There we explain to you how you can compile your individual TT bat for yourself, here in this table tennis shop.